Note: I asked for, and got permission from various UK sailors, and from Solway Dory to use their photographs and link to their pages. Solway Dory does not at present ship their products outside of the UK, because of past problems with damage and liability. I know they do not want to field a lot of emails asking for their products overseas. It is my intention to highlight what I consider to be good design, and to encourage the same kind of thoughtful design and careful craftsmanship here, that they exhibit across the pond. I've been thinking a lot about canoe sailing lately, for various reasons. I recently sold my first sailing canoe Spy, to a sailor up in Salem, Mass. on Boston's north shore, and that empty rack in the canoe shed has got me thinking. 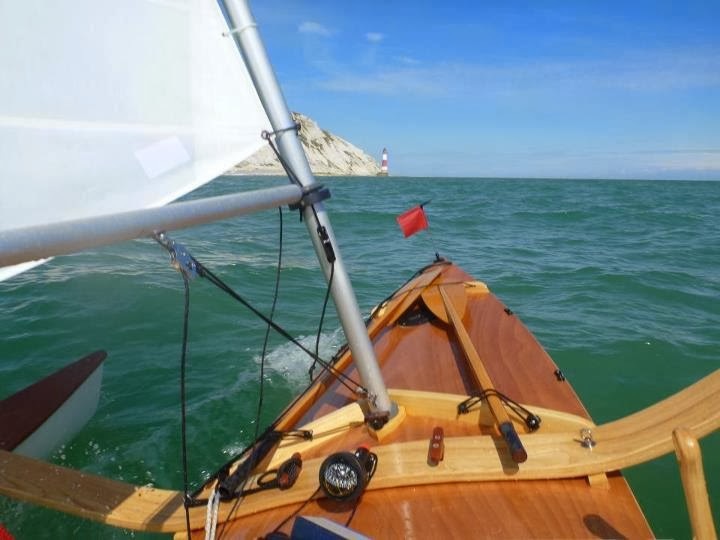 I have often wondered what I might do with a sailing canoe design if I started from scratch, with no pretensions to racing in any organized sense, but with the intention of building a wholesome and seaworthy canoe for day sailing and cruising. 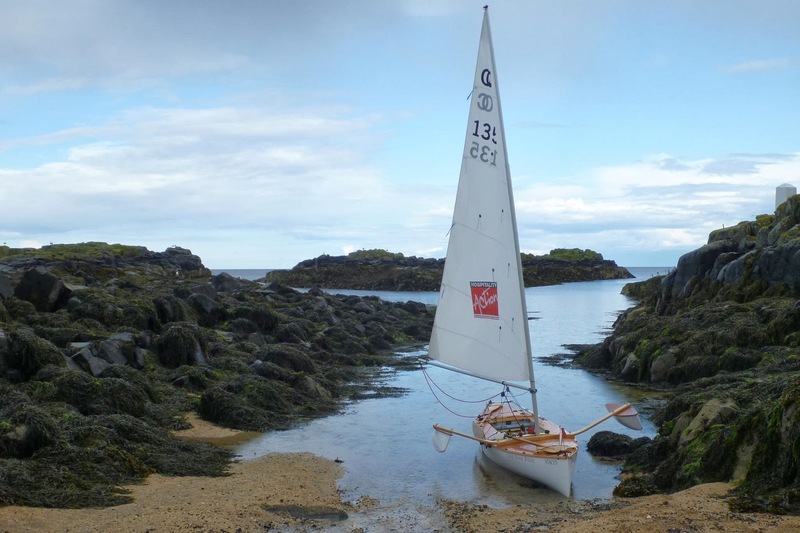 It was while banging around the internet in search of all things canoe sailing, that I came across the Open Canoe Sailing Group (OCSG) and Solway Dory, the UK builder of sailing canoes and rigs. I actually had heard of both of these outfits many years ago while racing in the ACA and C Class nationals at Moose Pond in Maine back in 1995. Several of the British sailors had come over to race with us, and to talk up the boats and events that they had going on. John Bull was the founder of the OCSG, and of Solway Dory. (Sadly, both John Bull passed away just last year.) With John came Keith and Ann Morris, Tony Ball, and Bernard O'Connor. The following year, several of the US sailors went to the UK to sail with them (couldn't afford it myself!). If memory serves, there was talk of establishing an International Canoe Rig for open canoes (not IC's, the sliding seat canoes), but I don't believe that ever materialized. 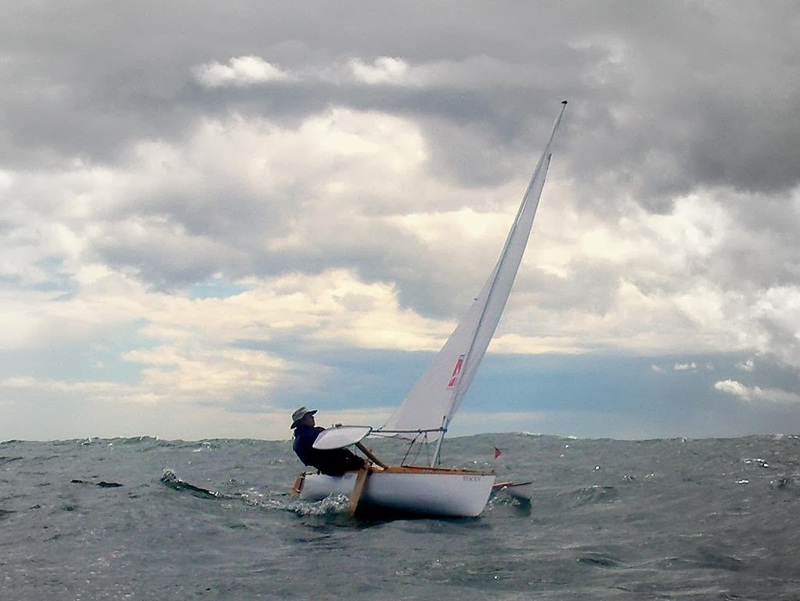 At any rate, over the intervening years I moved away from organized canoe sailing, built an outrigger, sailed a Hobie 16 for a while, and a 27' cruising cat, then with Holly, organized the dinghy sailing program at Sebago Canoe Club. But I always kept the canoes, sailing them mostly by myself, reveling in the simplicity and handiness that canoe sailing affords. It turns out these Brits have pushed the sport forward quite a ways, developing new boats and rigs, and organizing adventure cruising events all over Great Britain. Some of the canoes resemble our own, built on stock-boat platforms with drop-in rigs. 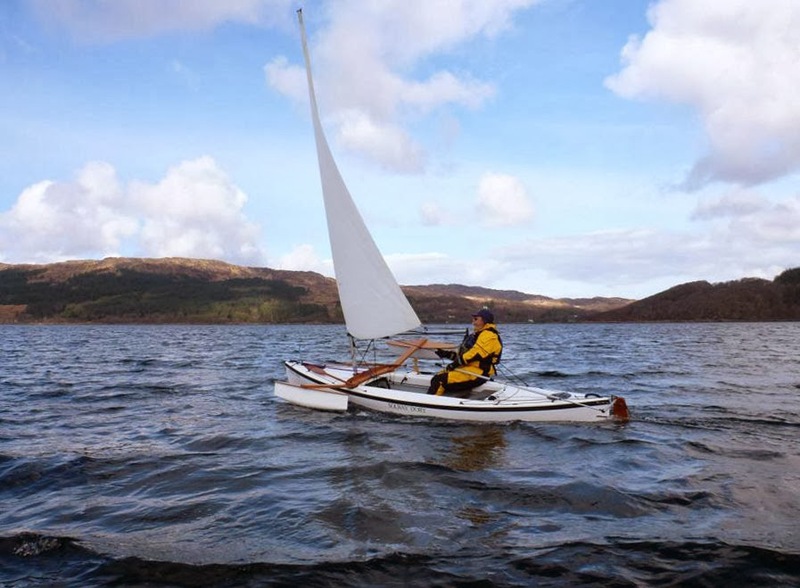 But I think the decked, expedition rigged Solway Dory models have a lot of potential for demanding sailing, and the boats are proven in real world environments, with several (highly experienced) sailors making very ambitious voyages. 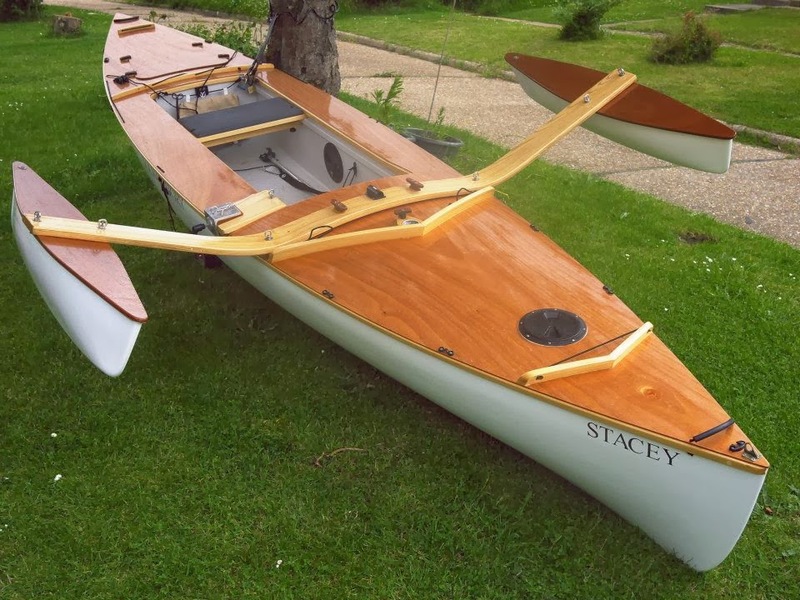 Astrid- Gavin Millars Solway Dory canoe. 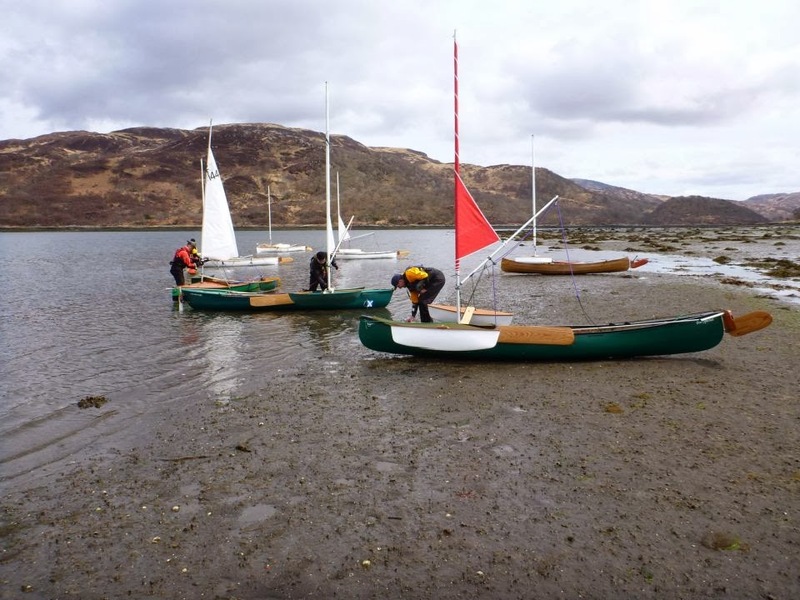 It is my belief that the development of these canoes without the constraints of class racing rules has had a very positive effect on the cruising capabilities that these craft exhibit. The Solway Dory models are a little different than what we are accustomed to here in the states. They are somewhat shorter and a tad wider, and I believe carry a little more rocker than ours do. Their Fulmar solo model is 14 1/2 feet long, with 40" of beam. The Shearwater is a solo or two-handed canoe that is 16 feet long, on the same beam. By contrast, my Mohawk Ultima, Alien is 18 feet long with a 38" beam and very little rocker. I can't speak to hull form, because I haven't seen the actual boats, or line drawings either (understandably). There are a couple of features in particular that I think are worth considering. Watertight bulkheads close off the end decks, and that's pretty standard. Additionally though, these boats have bulkheads running fore and aft down each side, creating large side buoyancy tanks in the cockpit which really aid in righting a capsized boat. These bulkheads run parallel with the centerline, and are a constant width apart. View of the deck and cockpit. Notice the side tanks. Gavin Millar photo. There is a removable seat at deck height from which to paddle. The seat can be easily adjusted fore and aft because of the parallel risers on which they rest. Paddling from the seat with a longish single blade appears to be quite easy. Paddles can be stowed on the fore deck. Gavin Millar photo. Leeboard bracket and cross beam attachment. Gavin Millar photo. There is no leeboard thwart, though there is often a thwart to land the mainsheet cleat on. The longitudinal bulkheads stiffen the hull, and the leeboard bracket is carried just on the side deck. 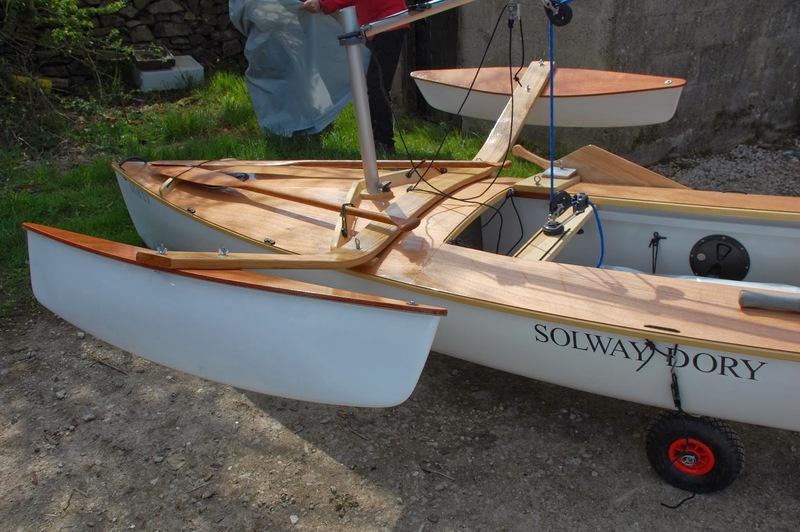 As an accessory, Solway Dory offers an outrigger package. These outriggers are interesting, in that they are intended as safety amas only. They are quite short, and carried high, well forward on a single cross beam. It is not intended that they be sailed immersed like a trimaran, but are there to provide an extra margin of safety in rough conditions. I doubt I would use them daysailing, but I certainly see their value in expedition type sailing. Gavin and Stacey. Gavin Millar photo. Most of the rigs I've seen are unstayed, unbattened bermudans which roller-furl around the mast like a Seapearl. They use end-boom sheets and kickers (vangs), which must be unshackled from the mast before furling. The decks are well thought out, having straps for paddle stowage and fairleads for rudder control lines, etc. 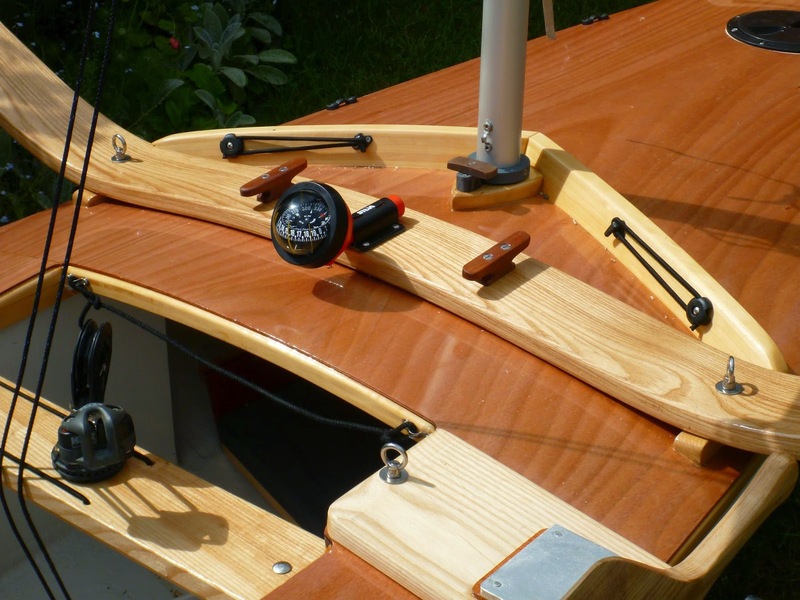 For steering, they all seem to use a single push-pull stick which snaps into a fitting to lock the rudder for paddling. The outrigger cross beams attach with just two bolts. 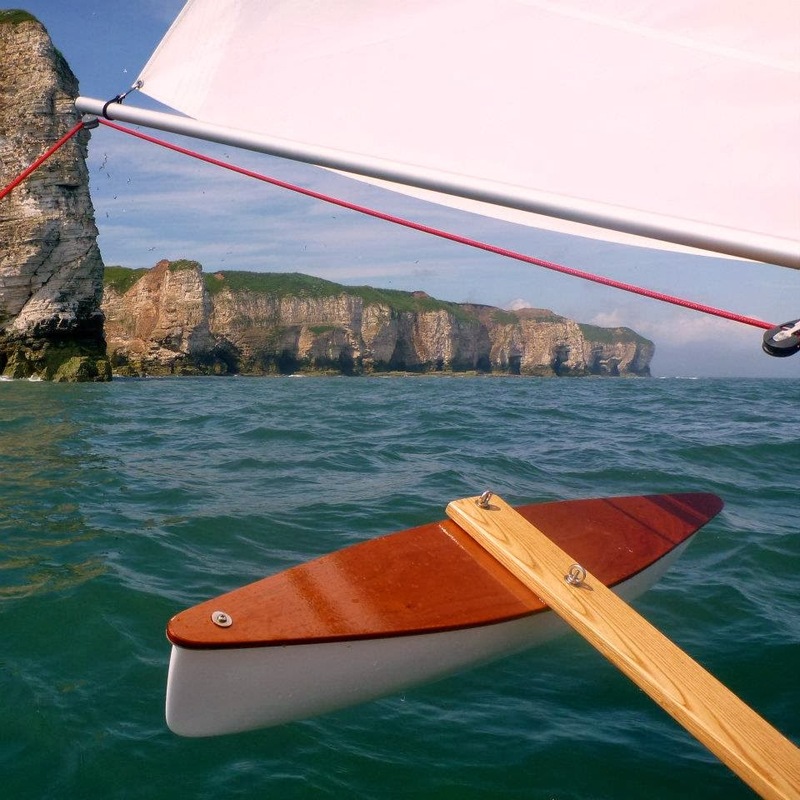 I believe that what these folks have brought to modern sailing canoe design is valuable. I know that some sailors in this country prefer narrow boats, with "sit-inside" cockpits and double paddles, but I'm a fan of the wider hulls, sailed like a dinghy. 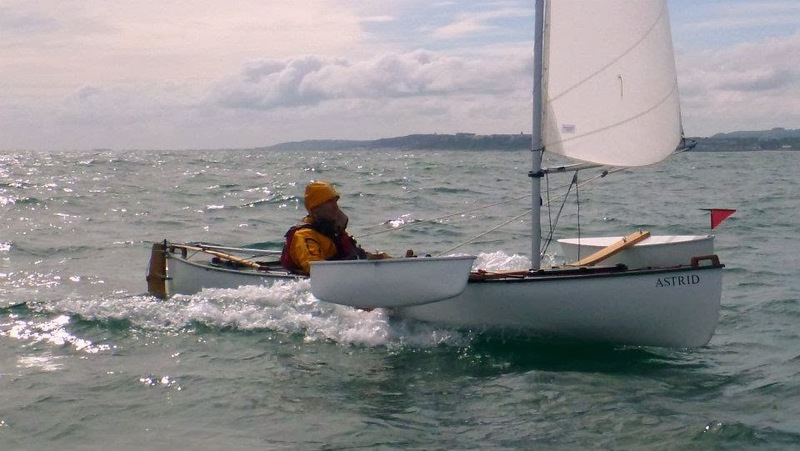 The sailing canoe (unlike most racing dinghys) is a boat that can be car-topped, yet loaded with gear for cruising while leaving plenty of room in the cockpit to sail from. The addition of fore and aft buoyancy chambers, smart deck layout, a wide, flat hiking seat on the side decks, and the safety amas for voyaging all contribute to a sensible design and a craft worth studying further. On the beach, rig furled. Gavin Millar photo. Loch Sunart. Andy Whitham photo. David Stubbs of Solway Dory. Andy Whitham photo. 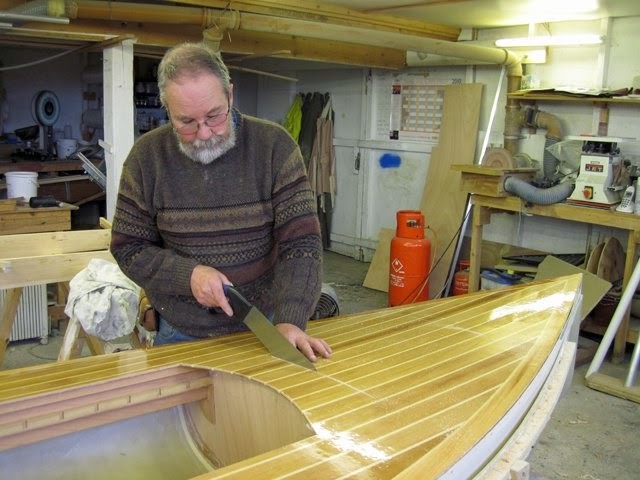 David Stubbs, fitting a deck hatch. 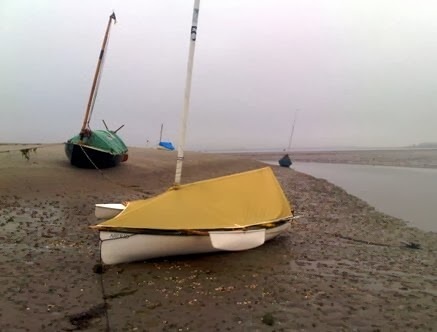 Solway dory photo. 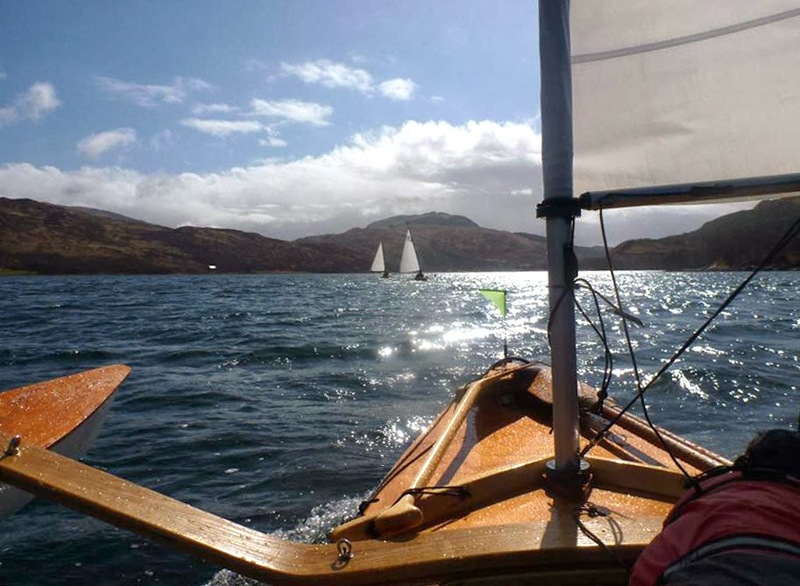 When I started looking over the UK canoe sailing scene, I came across Gavin Millar's blog. 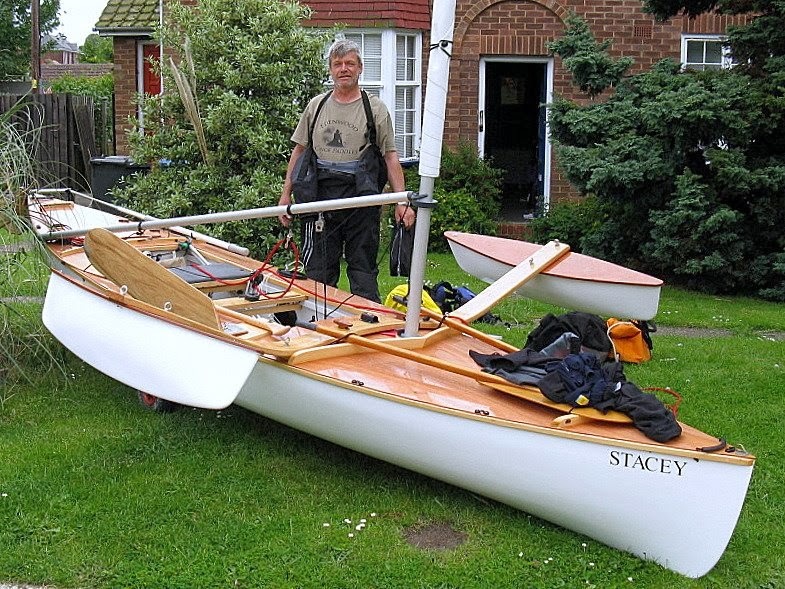 Gavin, who lives on the Solent in the south of England, proposed to sail solo in a canoe around mainland Britain, a distance of about 2200 miles. 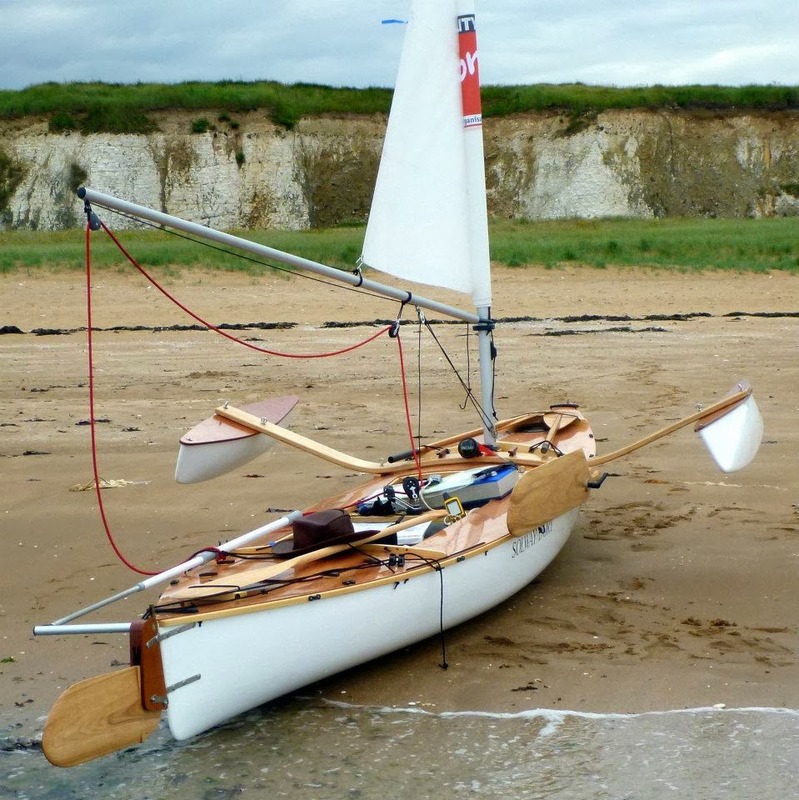 Gavin had Solway Dory build him a custom Shearwater, and prepared for the trip by circumnavigating the Isle of Wight. Gavin managed 1000 miles of the voyage, before running out of time and cutting the trip short. This is still a tremendous feat, and speaks both to Gavin's skill as a sailor, and to the suitability of the boat for expedition cruising. I can't do justice in this small space to Gavin's feat, but encourage you to read his wonderful blog describing the journey. It was largely through his very good photographs that I became interested in these boats. 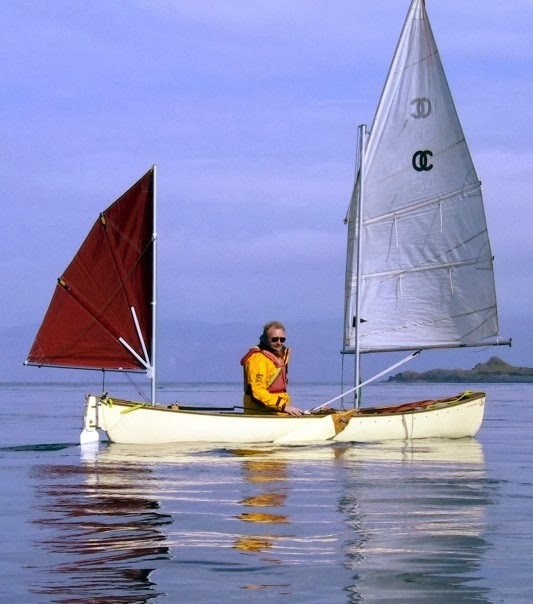 The OCSG and Solway Dory both have links to many cruises that are undertaken yearly in the UK. I've focused primarily on the decked boats, but I don't want to give short shrift to the open canoes. There is a ton of canoe sailing of all sorts in the UK. In the Lake district, in Scotland and, as Gavin has shown us, in the solent, too. Take a look at what these folks are doing, then let's get busy!